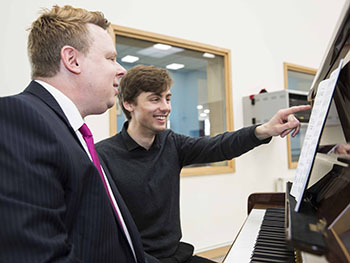 Birmingham City University’s Royal Birmingham Conservatoire and Elmhurst Ballet School are inspiring music students to experience the working life of a professional ballet pianist with its Placement for Pianists Programme. 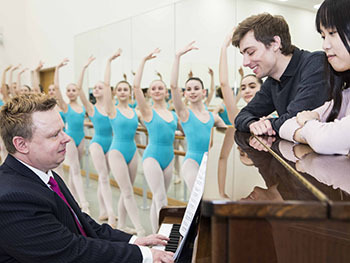 The programme provides a very rare opportunity for music students to explore the highly specialised artistry and technique of ballet pianism during mentoring, observational and practical sessions with pianists working full-time at Elmhurst Ballet School, the associate school of Birmingham Royal Ballet. Following initial meetings between Mikael Petersson, Elmhurst’s Music Planning Coordinator and pianist, , Royal Birmingham Conservatoire’s Luan Shaw, Head of Pedagogy and Community Engagement and Katharine Lam, Piano Tutor and Pedagogy Lecturer, Petersson and Jeanette Wong, a pianist from Birmingham Royal Ballet, were invited to speak to over 100 Conservatoire music students with the aim of introducing them to the fascinating world of ballet pianism. 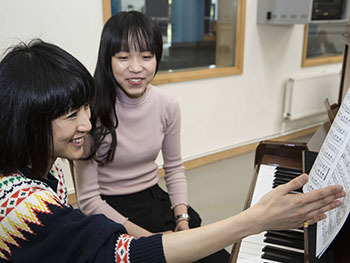 Uptake to join the Placement was large and after an audition process, piano students Connor Wilcox and Yung-Li Chen were selected to take part in the scheme – marking the first collaboration between the two Birmingham-based educational establishments. "Royal Birmingham Conservatoire pays care and attention to musicians as entrepreneurs, preparing our students for the opportunities and challenges presented by the future of the profession, and with the intention that they leave us as employable music professionals. Unique partnerships such as this one with Elmhurst Ballet School ensure that we are continually fulfilling our promise. I am delighted that this partnership with Elmhurst has come to fruition – the combination of some of the country’s best young dancers and pianists working together is simply electrifying, and exemplifies our joint ethos of wanting to further embed ourselves within the city we serve. It is fantastic that the Placement will continue next year and I am excited to see in which other directions our partnership follows. Over the last four months, Connor, from Burntisland in Fife, and Yung-Li, from Yilan County in Taiwan, have attended 10 programme sessions at the Edgbaston-based ballet school, have observed and played for ballet classes, have spent a day observing pianists at Birmingham Royal Ballet and have benefitted from one -to-one tutorials with Elmhurst’s pianists Mikael Petersson and Elaine Li – both also graduates of the renowned Royal Birmingham Conservatoire, which was granted its Royal title by Her Majesty The Queen in 2017.